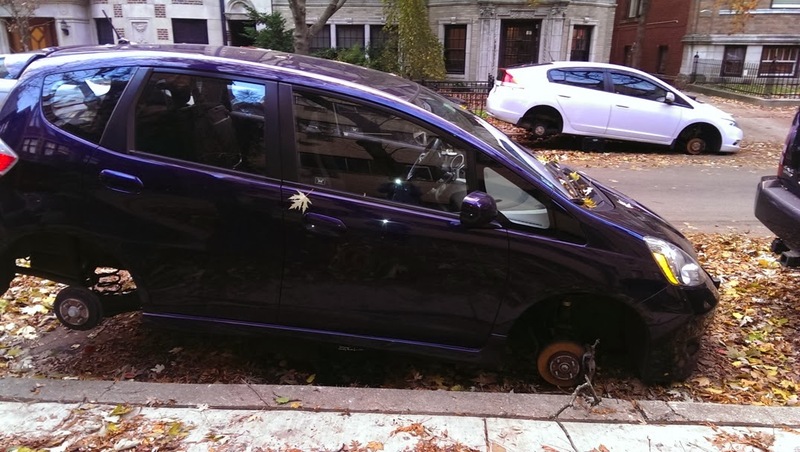 Two Hondas stripped of their wheels sit on Briar Place in November. Lock down your import car 'cuz they're back. At least three Hondas have been found up on milk crates and stripped of all four wheels in Lakeview and nearby Lincoln Park today. A rash of similar thefts hit that area as well parts of Lakeview in November. The thieves target Hondas and other imports that have small wheels, which are popular accessories for tricking out cars. Crated cars were found this morning in the 2400 block of N. Stockton, 2900 block of N. Pine Grove, and the 2600 block of N. Orchard. 19th district officers responded to a call for assistance from two off-duty officers working security at the Center on Halsted at 1:51 this afternoon. Initial reports stated that the officers were "fighting" with a man on the second floor. The man, described as a 51-year-old Asian man, was released without charge. His arrest record in Cook County includes allegations of aggravated assault in June 2012, shoplifting in October 2012, and trespassing in April 2013.